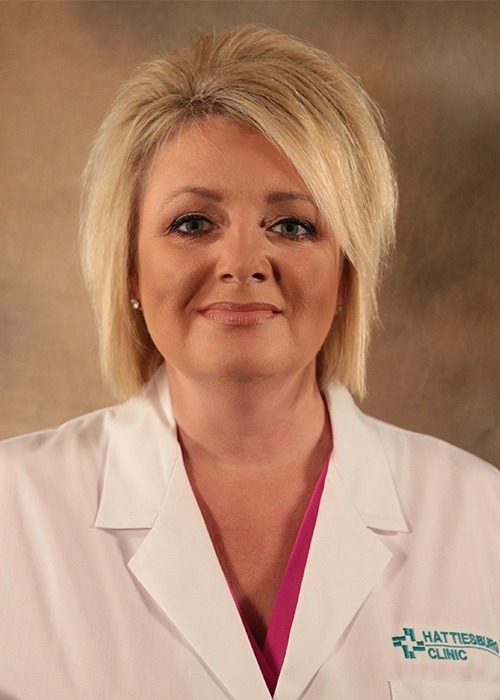 Traci D. Suber, CNP, is a certified women’s health nurse practitioner at Hattiesburg Clinic Obstetrics & Gynecology. Suber received a Bachelor of Science in Nursing from The University of Southern Mississippi in Hattiesburg, Miss. She received her Nurse Practitioner degree from Emory University in Atlanta, Ga.
Suber is board certified as a women’s health nurse practitioner by the National Certification Corporation. She is also trained and certified in the areas of cervical colposcopy and cryosurgery. Her professional memberships include the American College of Obstetricians and Gynecologists and the Mississippi Nurses Association. At Hattiesburg Clinic Obstetrics & Gynecology, Suber provides obstetrical and gynecological care to patients from puberty and up, including patients with high-risk pregnancies. Her goal, in addition to providing compassionate care, is to educate her patients on preventative measures and other health maintenance practices. OB/GYN is located at 28th Place. Emory University - Atlanta, Ga.